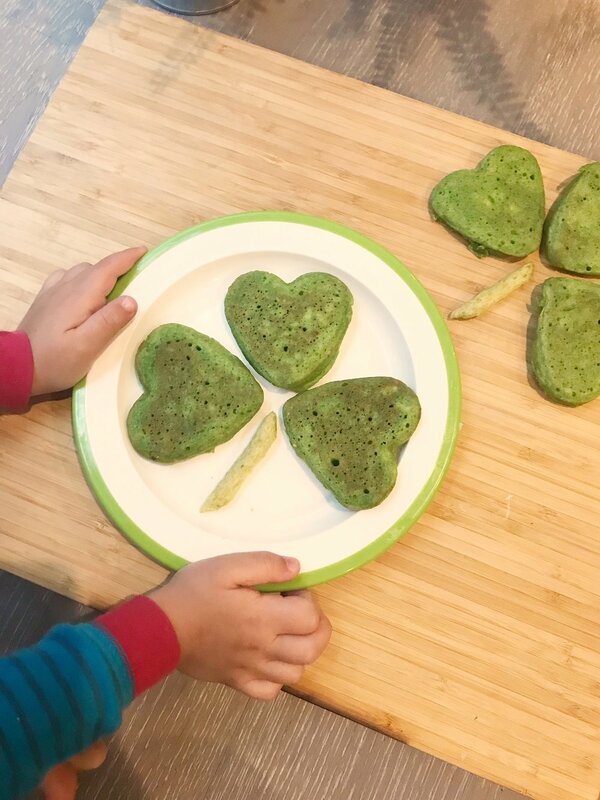 Is there any better excuse to force-feed your child get your child excited about green food than St. Patrick's day? I swear by baby spinach as my favorite healthy way to turn favorite foods green. It has a neutral flavor that blends seamlessly into whatever you're making: breads, muffins, smoothies, and pancakes! (Take a look at our yummy spinach muffins, here!) It gives these foods a vibrant green color--and not to mention a healthy dose of nutrients--without having to use food dyes. I've been known to blend it into pesto and even into my kids mac and cheese. Here, I added spinach to the blender with the wet ingredients of the pancakes so no evidence remains that there is spinach in these pancakes if you think your kids would be wary. But my kids are used to seeing the little green leaves go right into the blender, so they were happy to press the button and watch the milk turn green. I sweeten these naturally with banana, and you could easily replace that with 1/2 cup of unsweetened applesauce if you have that on hand. I also use white whole wheat flour so the color pops, but you could easily sub all-purpose flour or regular whole wheat flour, though the color might not be as vibrant with the latter. Whatever you decide, this is the perfect HEALTHY green breakfast for St. Paddy's Day, don't you think? Directions: In a blender, combine the spinach, milk, banana, and egg and blend until smooth. In a medium bowl, whisk together the remaining ingredients. Pour the wet ingredients into the dry ingredients and whisk until just combined. Heat a large griddle over medium heat and grease with butter. Pour 2 tablespoons of the pancake mixture for each pancake and cook until the top begins to bubble, around 2 minutes. Flip the pancakes and cook for one minute longer and serve.